I found myself in a cloud of fog, cold and wet. It encircled me and quieted all sounds, cutting me off from the outside world. Slowly the fog cleared and made a narrow path ahead that prompted me to follow it. I felt more like choosing to walk in the clear, rather than trudging off into the grey. The fog opened up into a circle where the air smelled sweeter, drier, and almost sticky. The fog closed in around me leaving me alone with some strange creatures in the grey moist light. The sunlight and all sounds were muffled as if I were underwater. And the creatures too, they looked like they’d be at home in the depths of the sea, or perhaps an alien planet. There was a green octopus with one black eye who glared at me with malevolence, daring me to stroke his red tipped poison darts, his stalks of pain. A lighter colored octopus floated nearby, reaching towards me and beckoning me to come closer. Many other green limbed creatures moved languidly in the air, bobbing as if they were waiting for a call to action. They seemed to welcome a touch, but were not actively seeking me out. For that I was grateful. There was menace in their structure. 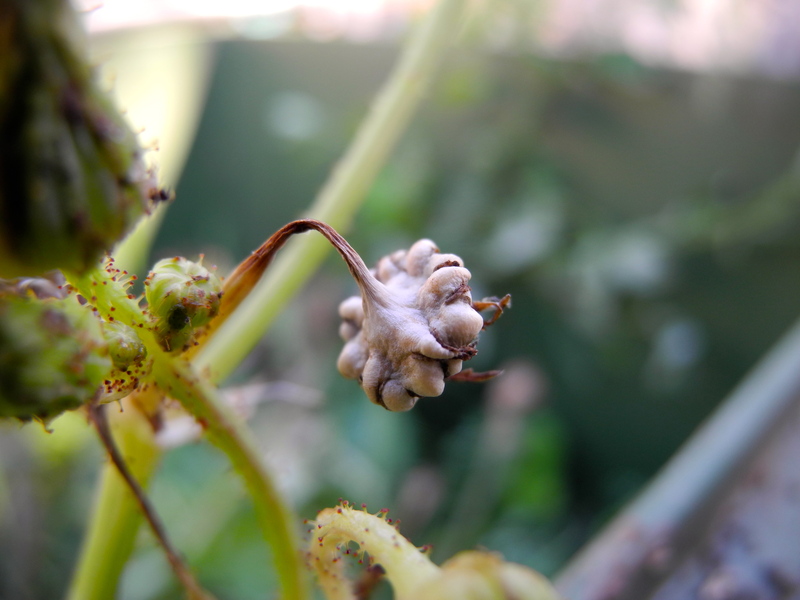 And then, in the center there dangled, facing away from me, some kind of seed pod, a storage unit of some kind perhaps. But what was it holding? I could not be sure for I was never able to see it from the front. Whenever I tried to get into a better position and get close to the face of it, the fog closed in and pushed me back. Or, the seed pod itself would turn and show me only its back. What was it hiding? Or was it protecting something? I only know that it held tightly to its burden and was carefully guarding it from my intrusion. Perhaps I should be glad. There looked to be tension and strength in the claws that grasped tightly at the bulbous mounds that stretched its skin to an old lady papery texture. And then it struck me. This could be a colony all designed to protect the bundles in the seed pod. Perhaps there was no threat in their posturing, perhaps all were merely defensive actions, designed to keep their precious cargo from being disturbed. Perhaps even the fog was a blanket that tried to wrap its soft tendrils around the group and hide the family that was protecting the treasure. I slowly retreated, backing away while paying no attention to the fog or my imagined scenarios of alien planets. They were no threat to me and I was determined to pose no threat to them. A glimpse into their world was the gift I received today. Thank you dear odd looking weed friends!